In 2015, a crash happened once every 5.4 minutes in a work zone across the United States. As crashes in work zones are becoming increasingly likely, new innovations were needed to be made to increase workers’ safety in the zone. Is adding a full matrix message board to the trucks in your zone part of the solution to keeping your work crew safe? Absolutely! What is a Full Matrix Message Board? As the message board is fully programmable, you can customize exactly what you want to display to best suit the operation you are currently undertaking. Applying a new display design is as easy as creating it on a computer program or phone application and sending it directly to the message board via Bluetooth signal. Because the display can be easily customized and changed, it makes the work zone safer as you can display a unique message to fit the current operation. This gives the most detailed instructions to motorists in the work zone, allowing for a safer work environment. 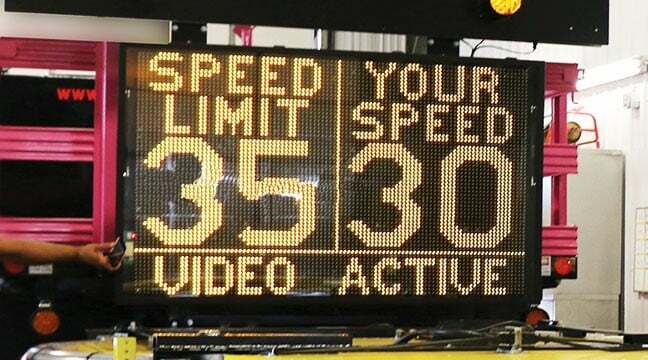 Serving as a radar board, the full matrix message board can not only display the posted speed limit, but it can also display the live speed of traffic heading towards the sign. Why is this important? Simply put, speeding in a work zone is both highly common and incredibly dangerous. According to the Federal Highway Administration, speeding was a contributing factor in 28% of fatal crashes in work zones in 2014. By going faster than the posted speed limit, a driver has less time to react to sudden changes while the vehicle they are driving needs a greater distance to come to a complete stop. This mix presents a dangerous combination for the drivers of the vehicles in the zone and the work crew alike. How can the radar board display on the full matrix message board help with this problem, though? 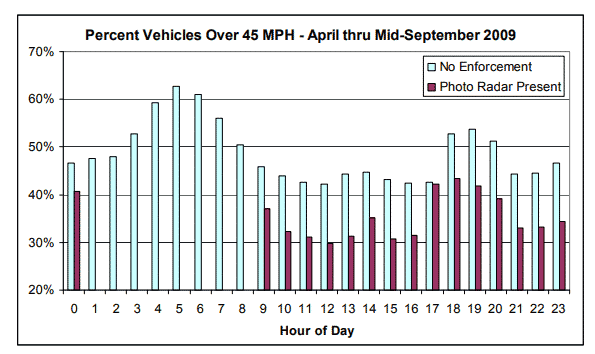 From “Photo Radar Speed Enforcement In A State Highway Work Zone”, a hourly comparison of the percent of speeding traffic in work zone with and without a radar board. In highway work zones, slower speeds equate to not only a safer work environment for the work crew but also a safer area to drive through for traffic. 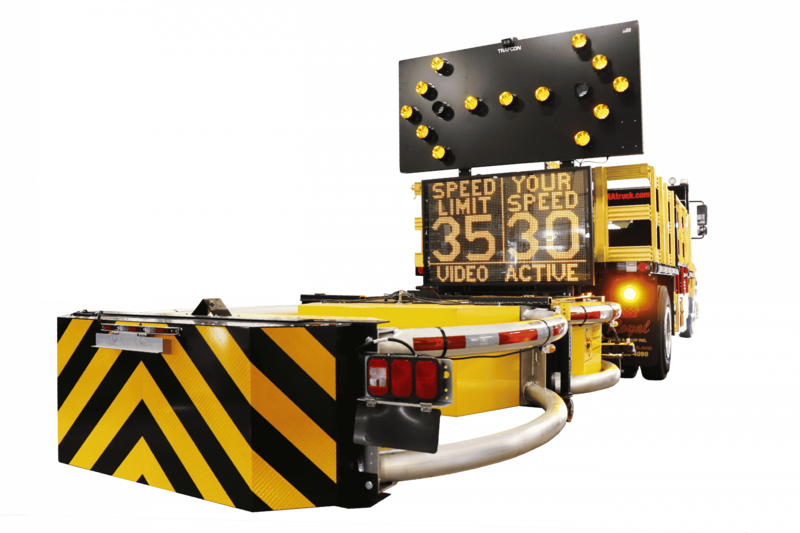 As a functioning radar board, the full matrix message board is a highly effective tool in making the work zone far less dangerous. One major feature of the full matrix message board is that it can be integrated with a camera system and DVR recording device that is on your truck. What does this mean? Imagine your TMA truck is hit by a speeding vehicle that entered the zone. With the message board integrated with the camera system and DVR recording device, you can overlay the output from the radar board on top of the recorded footage. This will allow you to see just how fast the driver who hit your truck was traveling at the time of impact, thus reducing your company’s liability post-crash by showing exactly what happened. Another feature of the full matrix message board is the statistics package. As a radar board, the board keeps a record of all motorists’ traveling speeds as well as the time when it occurred. What does this mean for your work zone? If you find that travelers are consistently going faster than the posted speed limit, you can show the tracked statistics to the local police force, who may be able to provide a presence in your work zone as another method of slowing down traffic. Watch the above episode of TMA Trucks A to Z to see the full matrix message board in-action, both as a radar board and as a message board. Also, learn more about the device directly from the manufacturers. In terms of best practices of how to safely and most effectively use the message board, the American Traffic Safety Services Association (ATSSA) provided several tips in its September 2013 document entitled, “Guidance for the Use of Portable Changeable Message Signs in Work Zones.” ATSSA’s best practices for message boards can be broken down into four core areas: message content, message length, message phasing, and required reading time. This manual instructs that, “the message should describe the problem, its location, and potential actions drivers can take to avoid or reduce the problem.” Displaying this message, such as a detour or lane closure instructions, should be direct in telling motorists how exactly they should respond given the situation at hand. Content displayed on the board should be brief enough that drivers do not need to spend significant time reading it while also being specific. This document suggests that the message should be conveyed in one or two phases. A phase is one display on the board before it is switched. For example, if the message board begins by displaying “Right Lane Closed Ahead” then switches to say, “Merge Left”, each quotation would be its own phase, totaling in 2 phases. In terms of phases, the message should be written and displayed in such a way that a driver can understand what to do no matter what phase they see first. It also should be written so that motorists can understand each phase by itself, not relying on the other for crucial bits of information. Additionally, each phase should be displayed for a minimum of two seconds so that passing motorists have enough time to read what is being displayed. Depending on what the speed limit is as well as how far of a distance you need the sign to be legible from, the height of the characters used on the sign need to be adjusted. For example, for work zones where drivers are traveling at a faster speed, characters need to be displayed much bigger than a slower work zone. Depending on which state your company operates in, there are different regulations regarding usage of the message boards. For more detailed regulations for your state, please contact us via this link! Adding a full matrix message board to your truck significantly increases safety in your work zone operations, both for your work crew as well as traveling motorists passing through the zone. Not only can it function as a radar board slowing down the speed of traffic, but it can also be programmed to display a custom message unique to your operation’s needs. While ATTSA recommends several areas of best practice in using a full matrix message board on your trucks, you need to ensure that your usage is compliant with your state’s regulations.